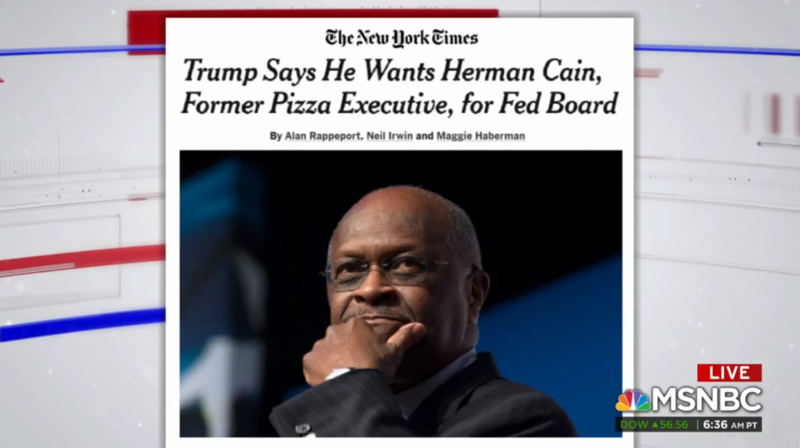 Cain also associated with a fraudster who was later barred by the SEC "from involvement in any future penny stock offerings"
Herman Cain, whom President Donald Trump is recommending to the Federal Reserve Board, has sent numerous sponsored emails to his mailing list promoting penny stocks that are now virtually worthless. Cain has also repeatedly touted penny stocks to his email subscribers. The U.S. Securities and Exchange Commission defines "penny stock" as generally referring “to a security issued by a very small company that trades at less than $5 per share” and says such stocks are “generally considered speculative investments.” The penny stock market is riddled with unsavory practices and fraud, especially because of paid promoters who attempt to pump up the price of penny stocks for the benefit of themselves and their employers. Media Matters has received numerous sponsored emails from Herman Cain promoting penny stocks which are now virtually worthless. Those emails, which were not written by Cain, told readers of countless future financial rewards, including turning "$5,000 into more than $40,000 within a few short months”; making "ten-times your money or better”; and becoming "multi-millionaires in the process." See the email, sent on 9/17/14, here. And you can buy VOIL right now for around $1.50! Opportunities like this don't come often. It's big, it's unprecedented, and it's happening right now. I urge you to follow up immediately. Virtus Oil & Gas VOIL could yield stratospheric gains for shareholders who move in immediately. See the email, sent on 4/10/14, here. Disruptive technologies have the ability to change society, revolutionize entire industries, and turn savvy investors into multi-millionaires in the process. American Heritage (AHII) is, in my opinion, destined to become one of the leaders in the fast-growing electronic cigarette business. Currently trading for about $1-2, the stock could easily double or triple in the next 18-24 months if the company remains independent. See the email, sent on 4/7/14, here. I discovered this company from one of the only investment banks that covers smaller industrial clean technology companies. These analysts (who are top drawer in the clean tech world) published an Ener-Core (ENCR)12-month price target of 2.50 dollars in the beginning of 2014. But I truly think their target price is too conservative in the short term--3 dollars is reasonable given that the company is OUT of its proof-of-concept stage and ramping up revenues in 2014 with a hockey-stick type sales ramp in 2015. You will need to act quickly on this...you've seen how as these Industrial Cleantech stocks get discovered many have exploded in value in a matter of weeks and months. The key to your chance for catching the NEXT 884% Industrial Cleantech monster winner is of course to be in the stock at today's prices...but you know that. See the email, sent on 2/5/14, here. Centor Energy (CNTO) just went public. Shares are now around $1, and as my just-released Special Report reveals, early investors are looking at a 1,200% winner. I'm John Myers and I'm going on record saying CNTO is set to jump from $1 to $8. And that's my short-term outlook. Longer term could see the stock climb to $25 and from there onwards to $100. See the email, sent on 1/29/14, here. KonaRed is already selling at Wal-Mart, Walgreens, Albertson'’s, 7-11 and other giant retailers in Hawaii. Now, this breakthrough sensation and the company that makes it, KonaRed (KRED) is ready for prime time. It is looking at rolling out all across the U.S. mainland! Investors are thrilled -– KRED is still under $1. Buy now! FREE report reveals how early KRED investors (such as you!) could turn $5,000 into more than $40,000 within a few short months. See the email, sent on 12/24/13, here. Endeavor IP (OTCBB: ENIP) represents the hottest company I've seen in decades. I believe ENIP is a company with little downside... and a strong likelihood of seeing an extraordinarily high upside become a reality. P.S. Make no mistake...it takes just one company to cut a deal - or attempt a buyout - and shares of Endeavor IP (OTCBB: ENIP) could potentially move so quickly you wouldn'™t [sic] have time to get in. That's why it's so important that you act now - before the window closes - to avoid missing out on what could be your second chance to turn $10,000 into $757,200 just like investors in patent stock VHC! See the email, sent on 8/19/13, here. North American Oil & Gas (NAMG)! This is an urgent buy recommendation to act on immediately! See the email, sent on 6/18/13, here. Cash in on the Greatest Materials Bonanza Since the Invention of Plastic! I think it could happen in just months! P.S. Graphite is such a modern-era commodity, watching this 40 cent stock hit $13.20 is certainly possible. Last century steel played the same role as a breakthrough material. And it was. See the email, sent on 5/13/13, here. • How this little-known breakthrough technology could help make the U.S. the world’s #1 Oil producer by 2017. • How this same revolutionary technology could be about to add some 6 trillion barrels oil to the world’s recoverable reserves. • Why Obama and the environmentalists will absolutely love it. • Why you really could turn $10,000 into $50,000 in the next 6-1`2 [sic] months if you act now! Buy Petrosonic (PSON) now while you can still get it at less than $1 and . . .
Look for $3.50 to $4.00 in six months or less! Hang on for a big-oil takeover that could rocket PSON as high as $30.95! See the email, sent on 5/10/13, here. Polar Petroleum (POLR) may be about to hand us a massive windfall, like we witnessed on Carrizo Oil (5,500%), Denbury Resources (3,400%) and Northern Oil (1,100%).